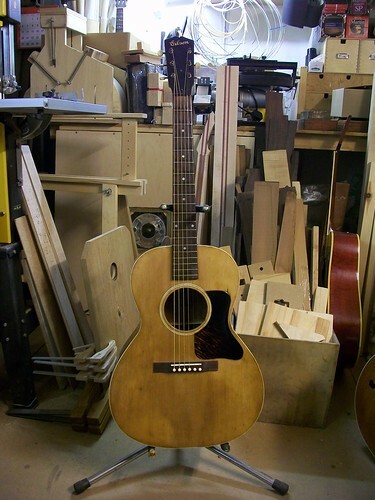 This Gibson l-00 dates back to 1934. 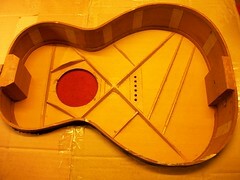 It has seen a hard life so far. 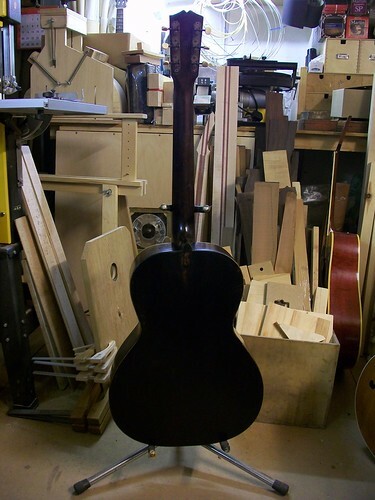 When it came into the workshop for renovation work it had been set up and used as a slide guitar with a high nut and bridge and a trapeze style tailpiece . 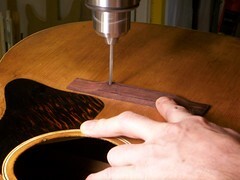 The guitar top is gentle wiped over with spirit. 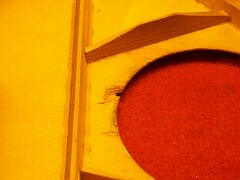 This dissolves the immediate surface and removes most of the dirt build-up. 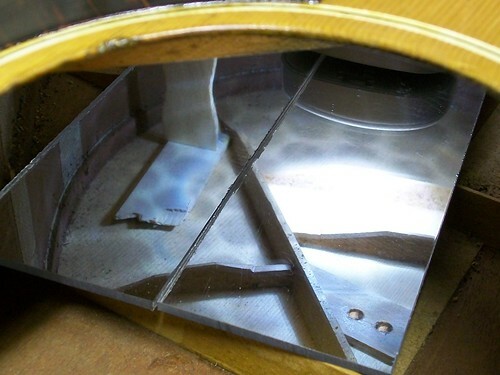 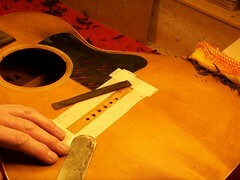 The guitar was fitted with an adjustable bridge from an arch-top guitar with the adjustable parts removed, the bottom flattened off, the two halves glued together and glued to the soundboard. 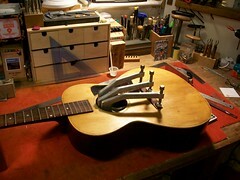 It’s doubtful, set up like this, whether the guitar ever played or stayed in-tune. 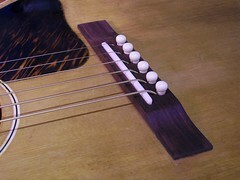 The easiest and less stressful way (for the soundboard) to remove this bridge is to plane it down to a thin strip. 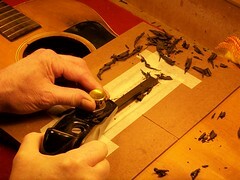 There would then be enough flexibility within the remaining slither to slip a wide-bladed knife under it to pop it off. 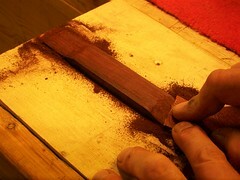 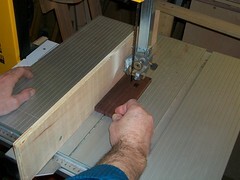 A piece of Rosewood is selected for the new bridge. 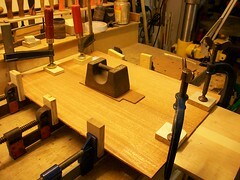 The new bridge is cut out, shaped, glued to the soundboard and bridge-pin holes drilled. 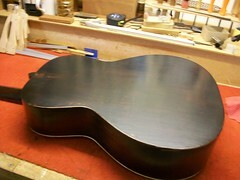 The back had been damaged years ago. 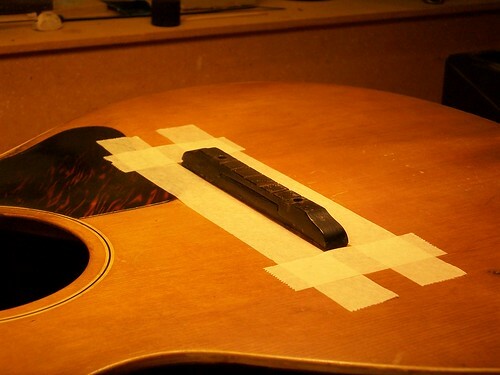 The repair look like it’s a DIY job. 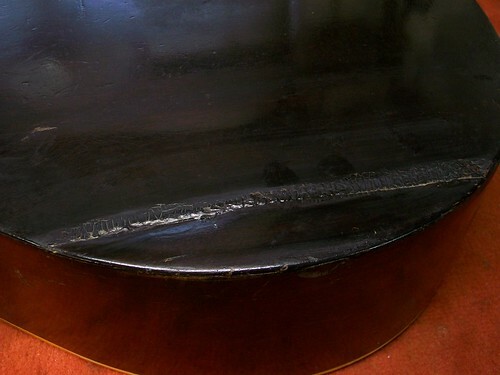 The crack was propped up from the inside and the crack filled with an unknown (possibly epoxy) and the whole of the back painted to match the sides. 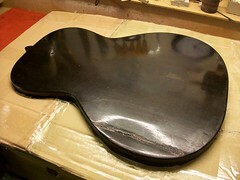 It had to go! 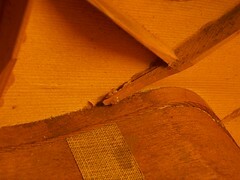 A repair had been badly made many years ago. 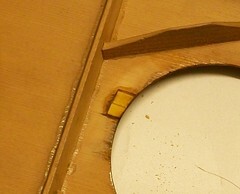 The back was propped up from the inside and the crack filled with an unknown (possibly epoxy) and the whole of the back painted to match the sides. 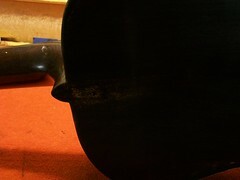 It had to go! 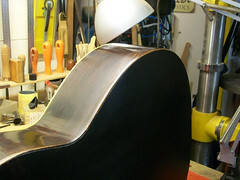 Prior to work commencing and during the initial workbench examination it is decided that the old back should be removed and a new back made. 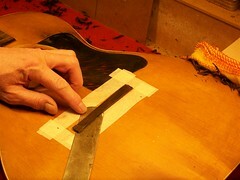 Mainly to remove the inside prop bungle and also to remove the ugly repair. 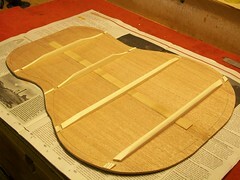 Firstly a temporary cardboard mould is made to prevent the sides losing their shape. 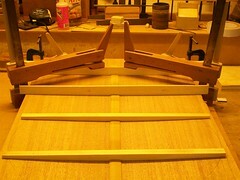 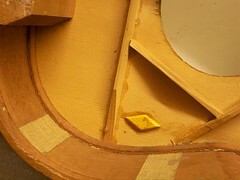 The back is removed making repairs to the internal part of the soundboard very simple. 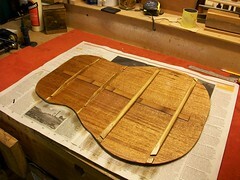 The new back is joined, braced, shaped and stained on the inside to give an aged effect. 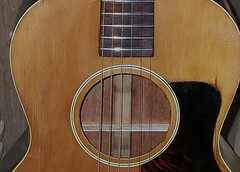 The guitar is set up and strung up with 12 – 54 strings. 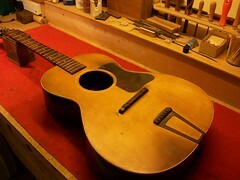 It now plays and sound like a guitar that has regained its mojo. 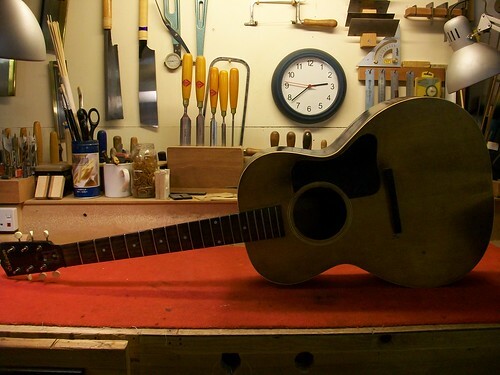 It’s a pleasure to save these lovely old instruments. 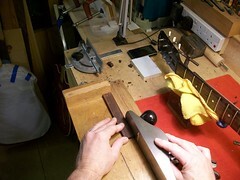 Look out for more restoration work on this site; you can even get regular updates by clicking the blog RSS button on the left of the page.